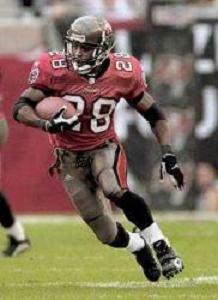 A three-time thousand-yard rusher in college who could also catch the ball out of the backfield, Dunn was chosen by the Bucs in the first round of the 1997 NFL draft (12th overall). With great speed and elusiveness, but considered too small to be an every-down back, he proved to be the ideal complement to second-year RB Mike Alstott, a classic fullback. Dunn followed up his outstanding rookie season with his first of an eventual five thousand-yard rushing totals in 1998 (1026). The ground total dropped to 616 yards in 1999, but he led the team with 64 pass receptions, for 589 yards. He was selected to a second Pro Bowl in 2000, rushing for 1133 yards and gaining 1555 yards from scrimmage, and caught 68 passes in ’01 (although he averaged only 2.8 yards per carry rushing), after which he moved on to the Atlanta Falcons as a free agent. After gaining 1304 yards from scrimmage in 2002, he was limited to 11 games by injury in ’03 but bounced back to have three straight thousand-yard rushing seasons, including a career-high 1416 at age 30 in 2005. He also achieved a career-best 1636 yards from scrimmage and was chosen to a third Pro Bowl. Dunn played for Atlanta thru 2007 and finished up with one last year back in Tampa Bay in ’08, running for 786 yards and catching 47 passes. Overall, he rushed for a career total of 10,967 yards on 2669 carries (4.1 avg.) and caught 510 passes for 4339 yards, giving him 15,306 yards from scrimmage - which ranked 14th in NFL history up to that point - and 64 touchdowns.